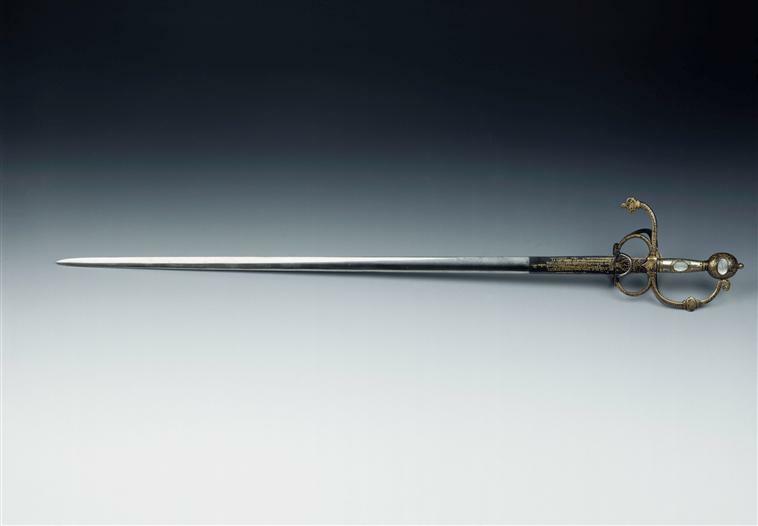 I viewed the posts in this thread, and saw beautiful examples of swords/rapiers, etc. through history. I feel there is a direct correlation between artistic/architectural elements, and the ornateness of weaponry in each era. 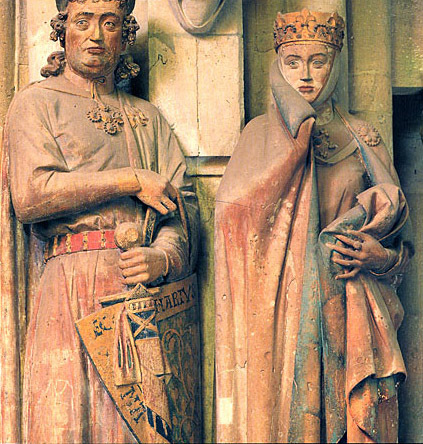 Attached is an image of the statue of Margrave Ekkehard, and his wife on the West portal of Naumburg Cathedral in Saxony (sculpted C. 1250). This single-hand blade is a prime example of the "elegance of simplicity", seen in the 13th C. vaulting of the cathedral's interior, the marriage of function and design. What impresses me most, is the mass of the pommel. Imagine the force, fed by rage, Ekkehard could achieve when his non-sword hand grabbed it for a two-handed thrust through the mail shirt of an enemy! 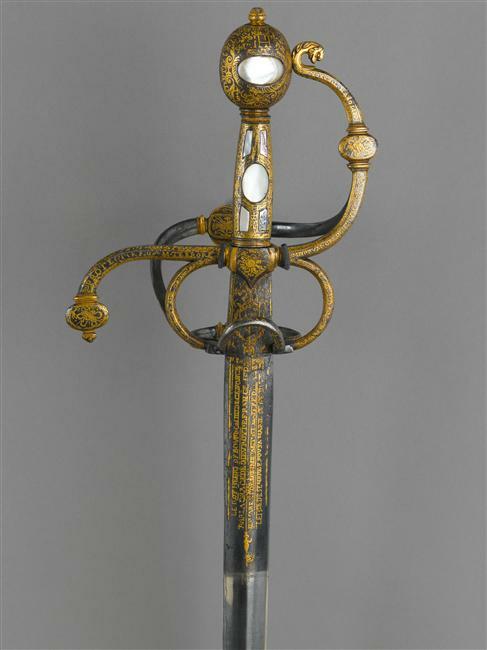 Close study reveals hints that both pommel and cross-guard were metal-worked, and probably bejeweled. The artistry of the scabbard, clasps, belts, etc. make it likely his sword had no less attention given to ornamentation. 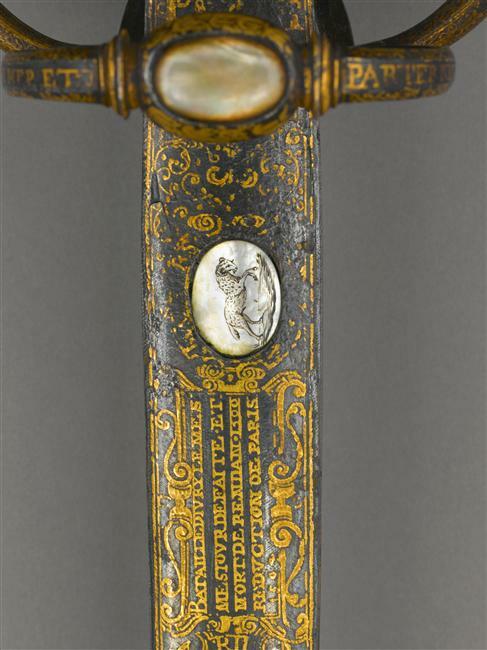 Though he was not depicted in harness, this sword was clearly symbolic of his rank, and likely the finest in his collection. In addition, note the size of his kite shield. The addition of poudrons, knee cops, etc. were beginning to alter the need for the great shields used by Crusader Knights of the prior century. Edit: I'm adding a quote from Kirk Lee Spencer's reply to Nathan Robinson (Page 2 of this thread.) 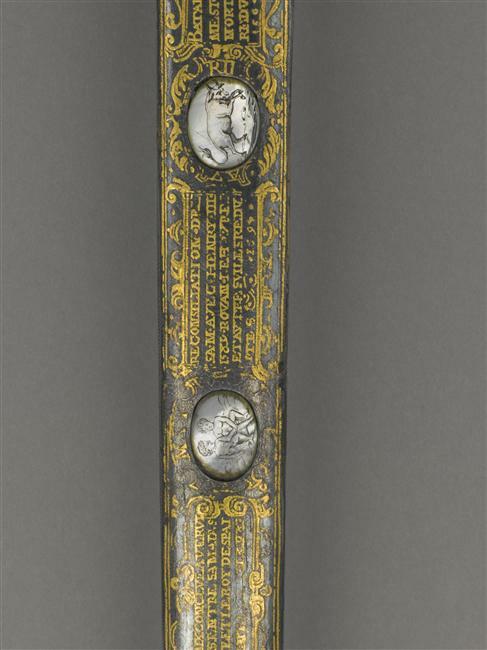 "The same dizzying overly encrusted decoration we see on most] [swords can also be seen in the architecture and visual arts of this time period (High Renaissance to Rococo). evidently during the high Renaissance a sensibility developed, and was passed through culture, that this "visual attention deficit disorder "was not silly but the very pentacle of perfection." Kirk's, and Nathan's comments infer the same reasoning as my above comparison of the Margrave's sword, and the vaulting of the cathedral where he and his wife are memorialized. Thanks guys! You gentlemen must have studied Art History as I have. 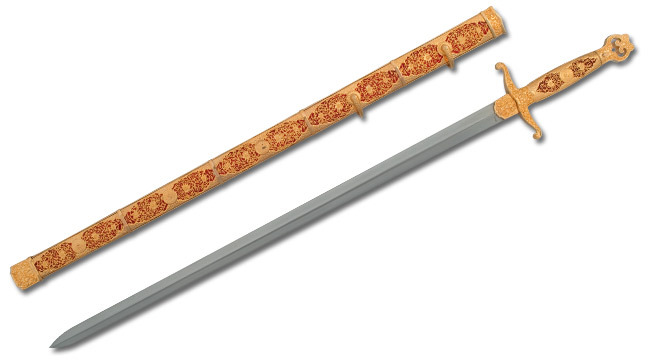 Swords do not need to be gaudy to be gorgeous. Il est apelée de Montfort. Il est el Mond, et si est fort. Si ad grant chevalrie; Je vois et je m’ acort. Il eime le droit, et het le tort. Si avera le mestrie! 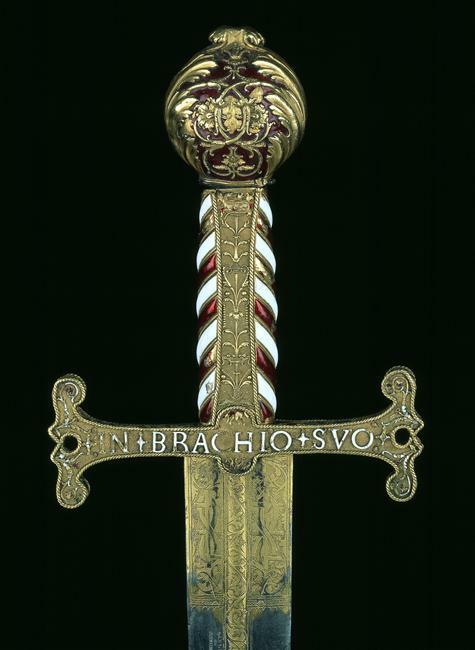 Consecrated sword of Jan III Sobieski. Dated at 1675 - 76, given to Jan III as " sigh of gratitude for defending the Christianity" or something like that. Looks very interesting, maybe I will find some better pictures later. Picture from Wawel Museum site. Another one which I don't think was posted before... 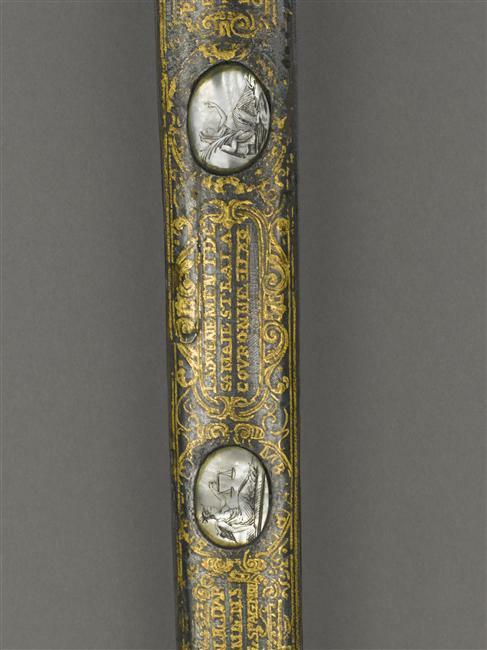 The sword of Louis the 13th, king of France (dated 1614). 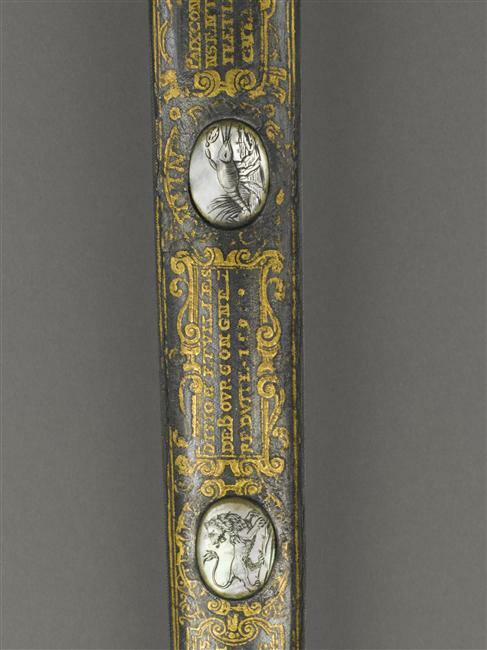 Currently held by the Musée de l'Armée in Paris. As you can see it bears the portraits of the previous kings of France... On the first pic are "Henricus Magnus" (Henri the Fourth, Louis the 13th's father), "Carolus" (most probably Carolus Magnus), "Henri III", and (I think) "Franciscus II". A neat idea, combining sword and family tree... Most logical for a king. That is a fantastic sword. Do you by chance have any images that include a full close up of the blade? If so, would you mind posting them on the Rosarial Swords thread? The markings on the blade look like the ones we are trying to research by collecting images and data. Hi Pamela, and thanks for the interest ! Alas there are no close-ups of the blade there... 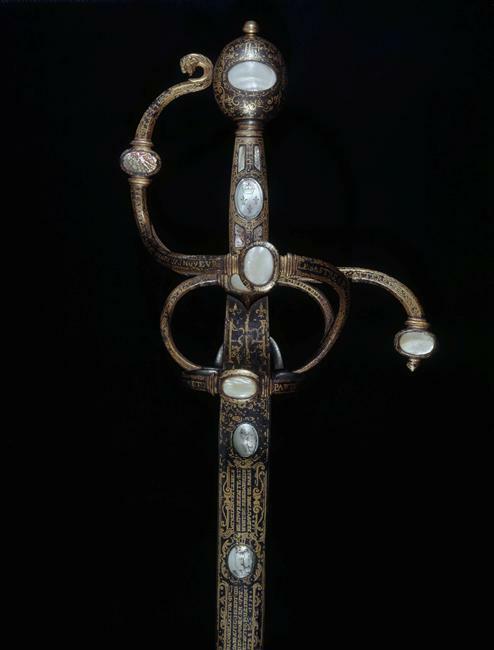 The sword is on display in Paris, your best bet would probably be to get someone to photograph it for you! I don't have any trip to Paris planned at the moment but I really should go visit the Musée de l'Armée once more one of these days... If I do I'll be sure to take a pic. Simon, Thank you for the photo link, it is much appreciated! Sadly, I don't believe I will be going to Paris anytime soon. Again, beautiful sword! Simon, that is an amazing sword. Do you know what the portraits are made of? Na sir 's na seachain an cath. 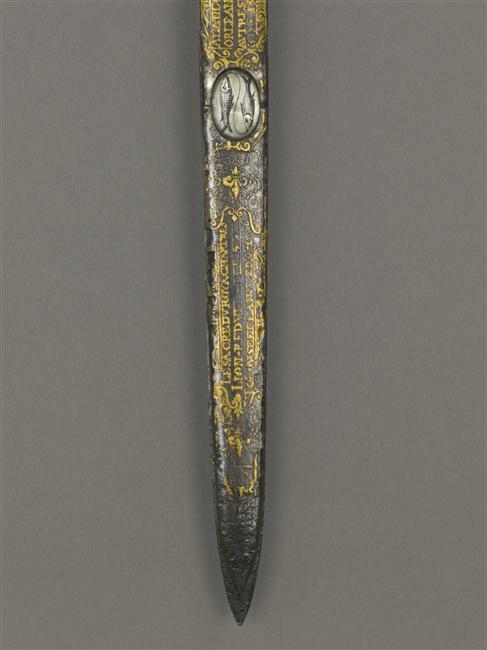 The website and the literature about the collections of the Musée de l'Armée only mention iron and gold as materials for this sword. But I think this description omits the portraits. Another art book (Raymond Cogniat, Jacques Hillairet: Les Musées d'art de Paris, 1967) says these medallions are cameos, which is far more likely. Thus they would be semi-precious, "layered" stones (I'd guess onyx, a common stone for cameos, given the black/white contrast). By the way, here is a picture of this sword's scabbard's chape, which apparently also held a medallion, but it is missing. And here is a picture showing the complete sword. This thread must live! It craves fresh posts! I'll feed it another French regal sword, that of Francis the 1st, which for some reason has its own article on the french Wikipedia ( http://fr.wikipedia.org/wiki/%C3%89p%C3%A9e_de_Fran%C3%A7ois_1er ). It is dated ca. 1510-1515. (The RMN website seems to experience problems, so I'll post more pics later). And yet another one... 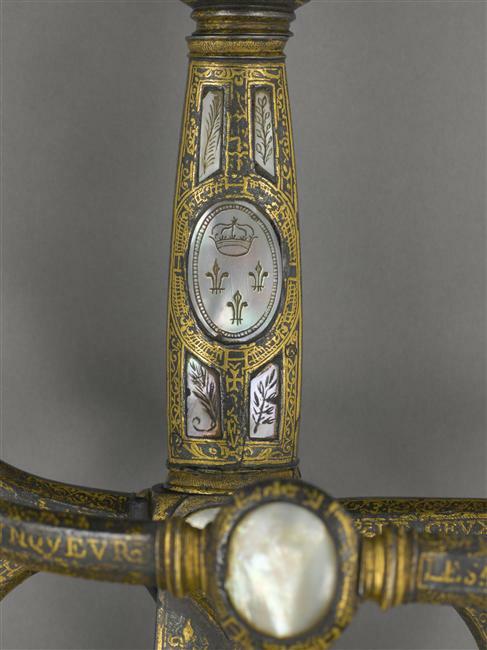 The sword of Henri the Fourth, a wedding gift from the city of Paris. 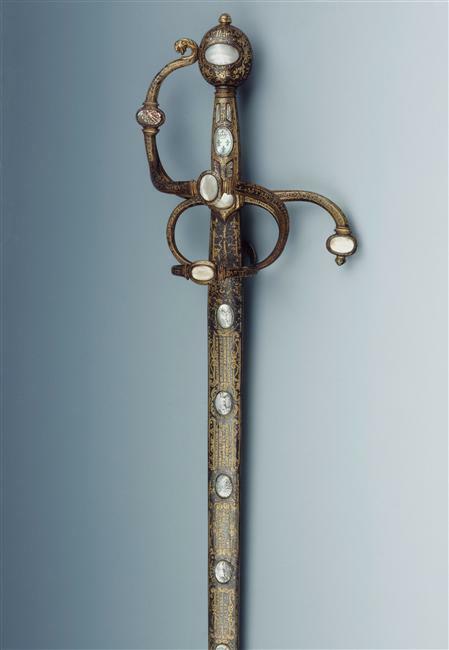 Dated 1600 ; steel, gold and mother-of-pearl. A pretty good gift, especially considering the scabbard. 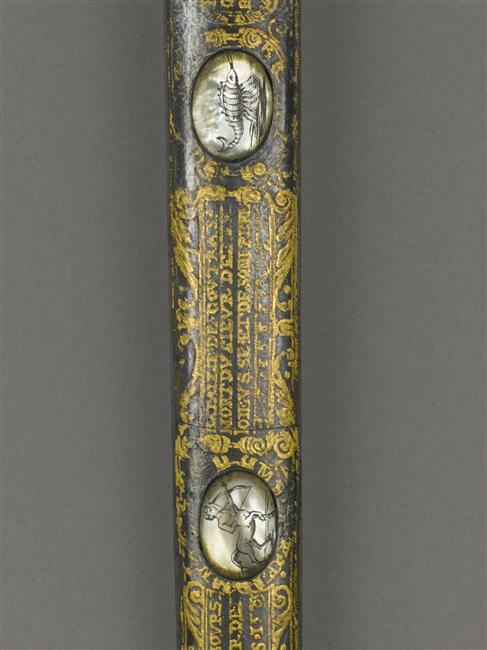 We haven't seen many ornamented scabbards in this thread, but maybe this one will start a trend? Craftsmanship is definitely the word here. As mentioned above at a time when carrying a sword was more to do with fashion and dress became somewhat an effeminate affair in Europe. The rise to more ornate metalwork to keep up with the trend lent more toward the jeweller as hilt-maker rather than the smith. That I believe is the main dividing line. Most of us I suppose associate the austerity of line and total practicality of the sword of war with a sort of male romanticism. Any embellishments at that period were generally funerary. I will say, thankfully, that the skills required to produce works of art in metal are not dead, though certainly not cheap, and that in my day, some forty years ago, a sword smith was only a surname. If a man can see beyond himself and reason with all things then it's time for him to leave this earth and rise into the heavens. Personally my impression of historical examples is that their ornamentation leads towards the "tacky but functional" line, while modern ornamentation can lead towards the "aesthetically pleasing but impractical" direction. 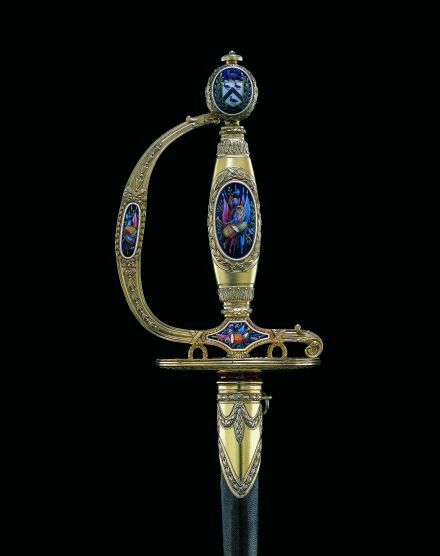 Which highlights the fact that swords are no longer in general use as tools of war, and their primary purpose today is actually ornament itself; further decoration being a mere enhancement of that. to me thats not over the top ornamentation as it is a bad sword period, and such bad construction isnt limited to over the top swords either there are PLENTLY of swords out there that have clean lines, and simple but nice ornementation of the guard sheath and pommel, (ok these aremore bad historical sword copies) but the quality of the steel and hilt materials is simply garbage their ill fitting etc. this is especially prevelent in the katana and ninja sword market or to put it simply..
so its worth seperating the difference betwen over the top and just shoddy construction. ou can hav swords which are still too heavy and impossible to hold even if theyre made of quality materials and constructon methods i.e a proper width tang and proper steel blade. for example. 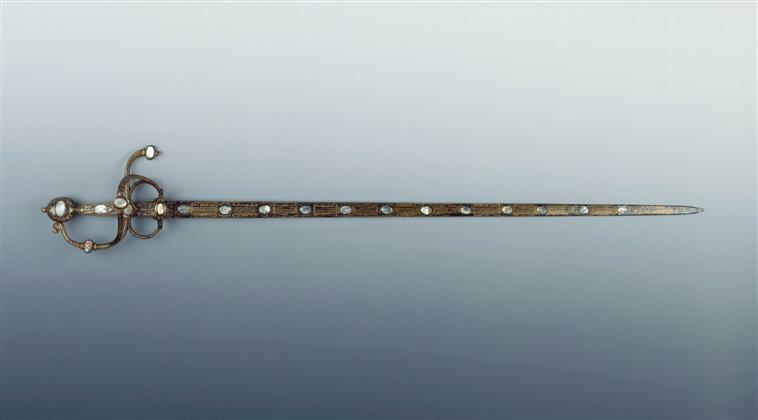 the hanwei ninjato isan excellent example because it is still technically a fantasy sword because there is close to no evidence for a sword like that existing let alone it being the standard weapon of shinobi. and as for historically, over the top onemented swords nd not just swords, its abit on a tangent but theres also armour pieces like parade armour. William, with all due respect, I think you've missed the point of this topic. 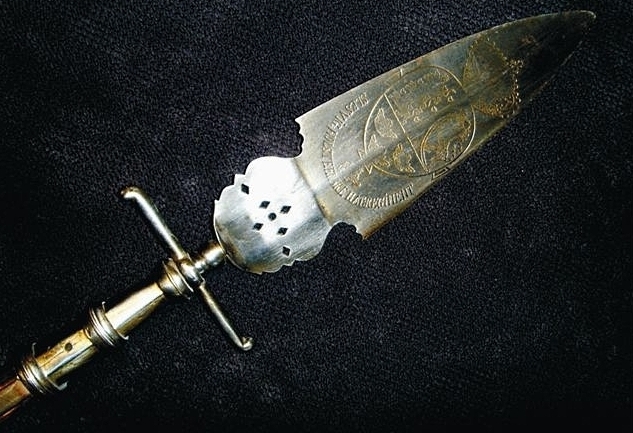 the point of the topic, unless im mistaken is looking at modern 'fantasy swords' and how they are made ornamental. and the (quite false) assumption that historical swords are all fairly clean lines and such where the reality is that there are many swords that are just as gaudy even if those are somewhat impractical for battle. 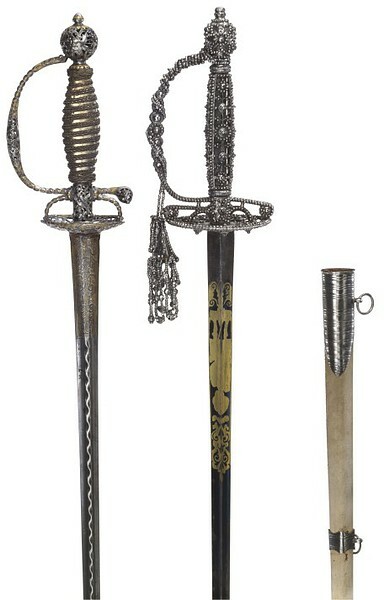 and showing those highly ornamental swords, as well as discussing what makes a beautiful sword. 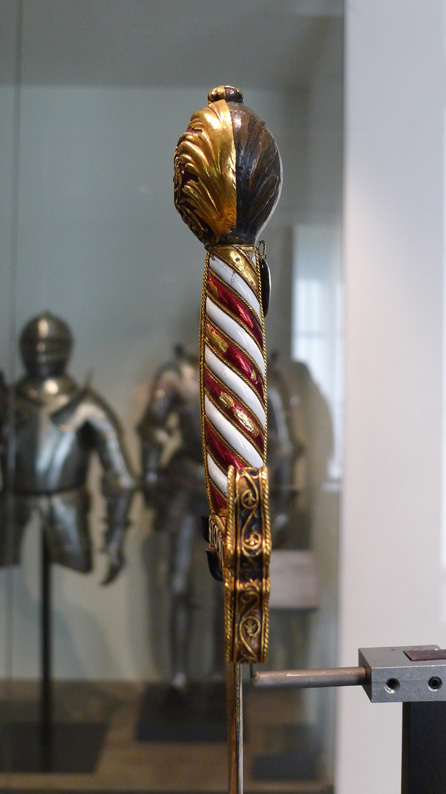 the point im making isnt in disagreement with the OP's point infact i have a book looking at that famous austrian armoury, the Landeszeughaus - Graz Armoury which shows many highly ornamental items, not just word, but polearms and armour. 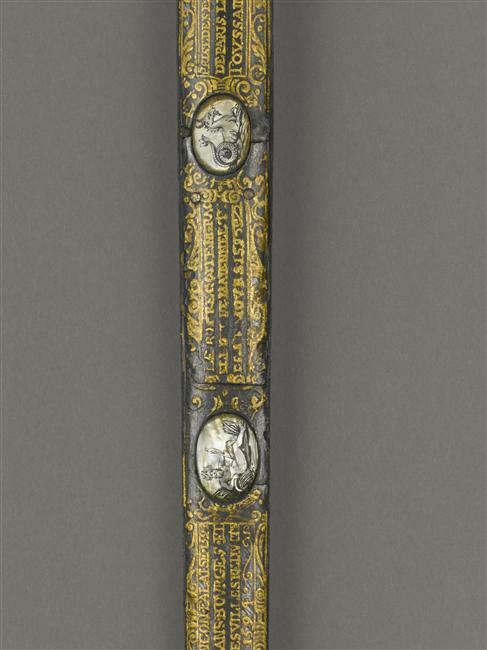 In response to Simon G's pictures of the sword of Francis the 1st ... I just have to post pictures of the back of this sword. It does have a clear front and back - but why would they decide to only save gold on the pommel? You pretty much got it. The point was the first sentence in the topic, "There are a lot of misconceptions being posted on the various forums lately regarding fantasy swords being so much more ornate than anything history has brought us." Largely, I was pointing out that many people do not realize that history has brought us much more "fantastic" swords than can be found in modern-made swords. The techniques, materials, and investment put into these pieces from history is often far beyond those achieved in modern examples. I wasn't focusing on beauty, practicality, or any of that. Like you say, there are many people who believe history equates to non-decorative, spartan, or utilitarian and so tend to drive towards modern fantasy to try to "spice things up." Just a little research will show those who think such things that history has brought at least as much variety and crazy designs as modern fantasy has. Your point is well made Nathan. 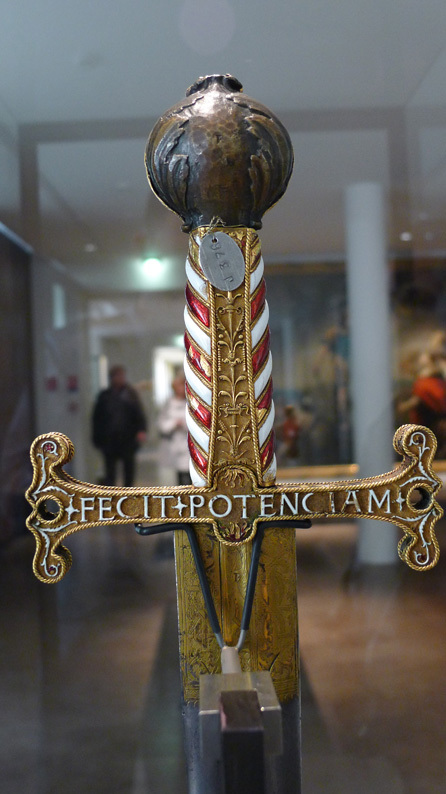 But I guess I'm a party-pooper, because I just don't like extra ornamentation on swords, whether historic or not. I like the dull gleam of steel and the clean geometry that arises from functional design. I'm trying to recall something Oakeshott said in AoW when talking about the transition from bejeweled migration era swords to Ulfberht-style swords. It was something like (regarding the latter) 'surely this is the very essence of beauty, deriving from form and function'. I'm on that team. Must have something to do with my puritanical Scottish pioneer heritage. But each to his own...I guess it would be boring if we all liked the same thing.